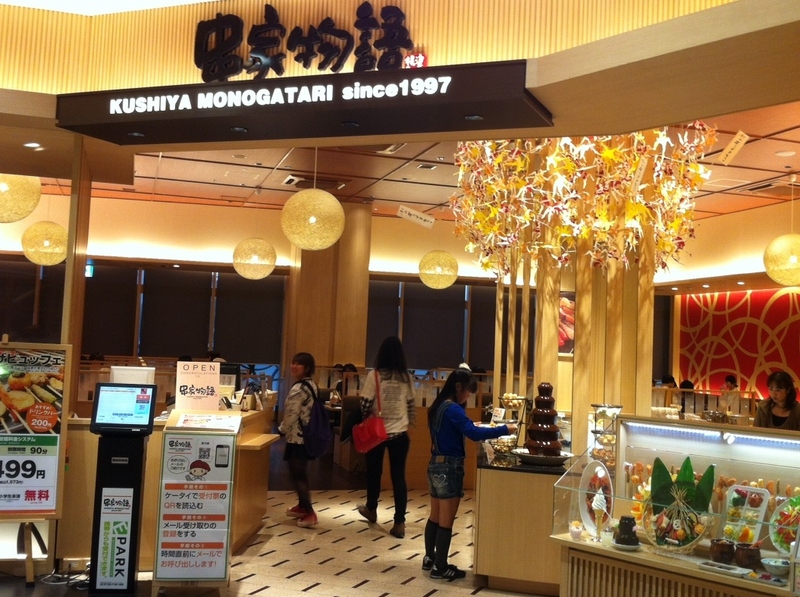 If you are looking for fondue, look no further than Kushiya Monogatari, at the eastside Aeon Mall. 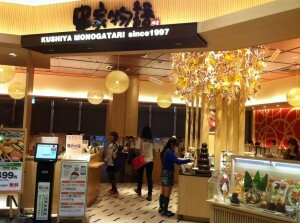 The restaurant is located just inside the Mall’s west entrance (by Mister Donut). Walk through the entrance and turn left. If it’s your first time, be sure to ask for help, the workers are very friendly. But just in case, here’s the rundown: You will be given a bowl of milky batter, and another of bread crumbs. 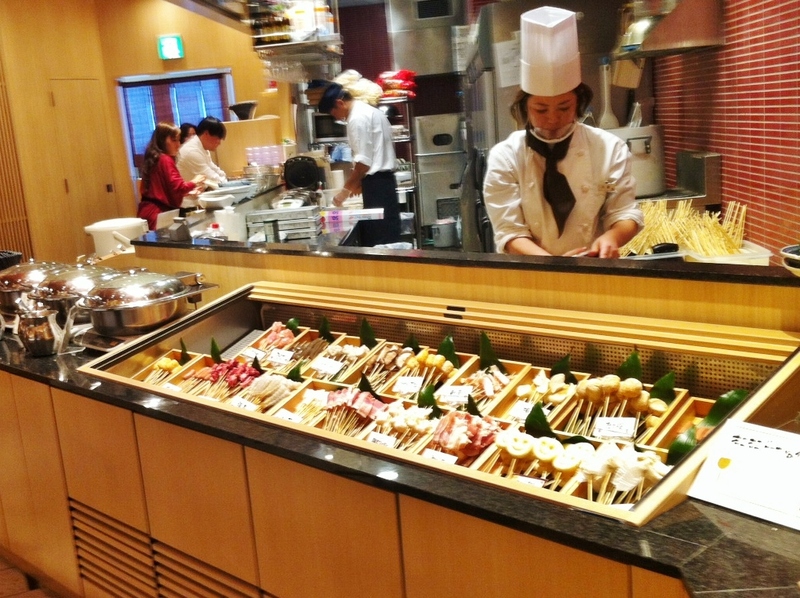 Walk up to the buffet and choose your “food on a stick.” These foods include meat, vegetables, potatoes, seafood, and more. 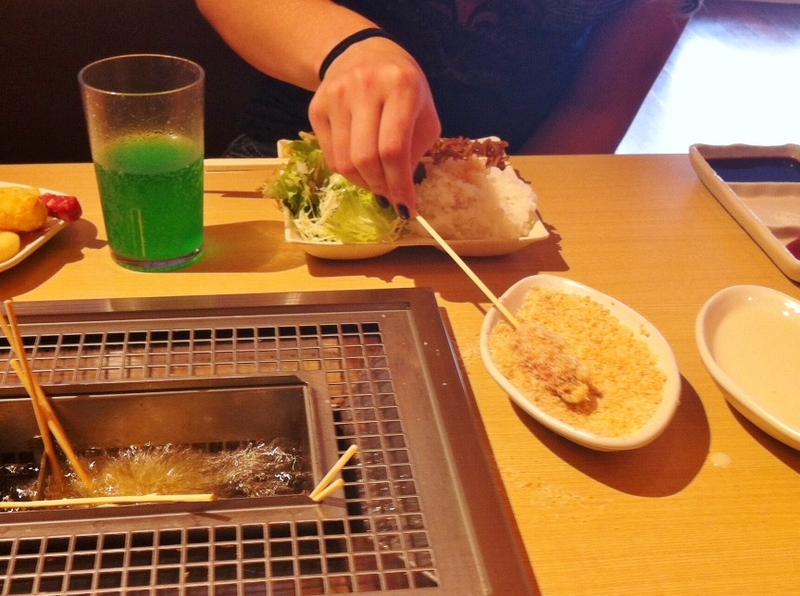 When you return to your table, dip the desired item in the batter and then roll the item in the bread crumbs. Place the breaded item in the oil and fry to perfection. The restaurant includes plastic bibs and a cover to prevent oil splatter. Once you are finished cooking your items, choose from a variety of sauces to dip them in. The sauces are located at the buffet near the drink machine. Sauces include spicy, sweet, cheesy, etc. and are marked in English. When you are finished with your stick, you can place it in a handy cup located on your table, to reduce clutter. If that isn’t enough, there is also yakisoba, curry, salad, dessert, etc. 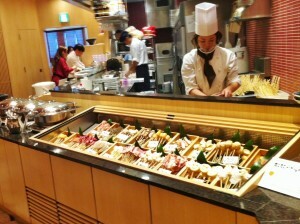 at the buffet. Be sure to save room for the dessert, a chocolate fountain!! They have marshmallows, pastries, fruits and more. I also recommend frying up a wedge of pineapple, yum! This entry was posted in Malls, OUT THE EAST GATE, Out the East Gate, Restaurants near here. Bookmark the permalink. My husband and I went on a Tuesday night and were pleasantly surprised! It was approximately 2000 yen per adult, 1000 for students, and free for the little ones. 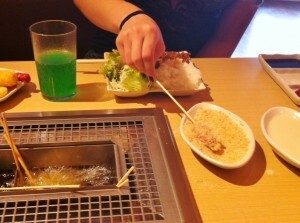 The food was great and the service was excellent. We were seated at a booth and the seats lift up to provide storage for your bags/jackets/purse/etc. The man who seated us gave us an instruction sheet in English, and showed us how to refill the batter and bread crumbs. Most foods take 1 to 3 minutes to fry. The instruction sheet has directions. We will definitely go back.